Kerah is a Redguard pawnbroker who has a stall in the Markarth marketplace where she sells the silver jewelry made by her husband, Endon. Their daughter, Adara, frequently boasts that she is going to be a silversmith like her parents. They also have a son, Cade, who is currently fighting with the Stormcloaks. Asking Kerah about Markarth will result in her suggesting that you should visit Calcelmo for information about Markarth's history—and perhaps also deliver a ring to him while you're there. If you deliver the ring, her disposition to you will increase, allowing you to freely take low-valued items from her house. 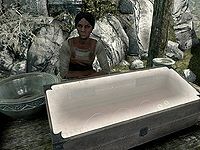 When you first enter Markarth, she is found at the stall, and is one of the bystanders of the attack in the marketplace. After this, she will start her normal schedule. She gets up at 8am and goes straight to her stall for work. She can be found behind the stall until 8pm, when she goes to Silver-Blood Inn with her family for three hours, either eating or conversing with Endon and Adara. At 11pm they head home. She wanders around the house until midnight, then heads to bed. Kerah wears a set of merchant clothes and a pair of boots. She is equipped with an iron dagger, and carries her house key, a key to her jewelry case, and a selection of upper-class items and gold. As everyone witnesses Weylin killing Margret, you can hear Kerah wondering, fearful: "What's happening to this city?" She can also be found saying, "The Forsworn. Here inside the city." and "He was after Margret. Why?" in shock. Approaching her will have her say, "Margret. He... he killed her. Right in front of me." If you tell her that you were actually looking to buy something, she will refuse apologetically: "I'm sorry. I don't think I can bare [sic] to sell anything right now." Should you ask if Kerah knew the murder victim and who she was, she will reply, "She's a traveler, from the Imperial City. Came by every day looking for jewelry for her relatives back home. Why would anyone want to kill her? It doesn't make any sense." If you have prevented Margret's death by killing Weylin, you can instead ask her if she knew why he was after Margret. She'll reply, "No. She's such a nice woman. Comes by every day looking for jewelry for her family in Cyrodiil. Is it because she's a noble? Why would anyone want to kill her? It doesn't make any sense." She is understandably traumatized by the attack, and so cannot be bartered with, and you can only talk to her about Margret. The next day, however, Kerah will resume her business. She can be found advertising her jewelry, saying things like "The finest jewelry in all of Markarth. ", and "Redguard craftsmanship in every piece." Approaching her will have her advertise to you as well: "Are you looking for a gift for a friend, perhaps? Or... a lover? ", "Perhaps a silver necklace or a silver ring? Easy to wear and soft against the skin. ", and "I have a necklace that would look lovely on you, or on a... special someone." At other times she may instead tell you about her daughter: "My daughter Adara is going to be a fine silversmith when she's older." If Markarth is taken over by the Stormcloaks, she will comment on it: "Silver-Bloods tax everything now that they run the city." After escaping from Cidhna Mine, she will say, "You. You aren't with the Forsworn, are you? People say they saw you when the prisoners escaped. So many dead." If you sided with Thonar Silver-Blood during the quest, she will instead tell you, "I heard about you being pardoned. What were the guards thinking, taking you in?" Ending conversation when she is at her stall will have her tell you, "Come back if you need a new ring or necklace." If she is not at work, she'll instead part ways with "Stop by my stall in the market sometime." If you later try to question her about Margret, she will refuse, saying, "Please. I don't want to talk about it. All that blood." She'll instead direct you to the inn: "If you want answers, ask at the inn. She told me she was staying there." Once she overcomes her shock, you can comment on the city and ask how long she has been there, which will have her reply, "My family came here centuries ago. We've made a good living smithing the silver that flows through the city. But you probably wanted to know about the fancy carvings and stonework, didn't you? Travelers always do." 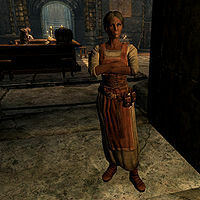 She will ask you to deliver a ring to Calcelmo while you go to him to learn about Markarth: "Here, I have a delivery I need to make to Calcelmo. Why don't you take it to him? He knows the history of Markarth better than anyone." Replying that you'll make sure he gets it will have her respond, "Thank you. He can be a bit difficult, but I'm sure he'll appreciate your help." If you tell her that you don't have time right now, she'll instead reply with "Very well." Upon giving the ring to Calcelmo, he'll mention her: "Oh, that's right. I keep forgetting to pick that up. Poor Kerah, such a patient woman." Hroki: "Kerah, do you have anything... exotic? Something no other woman in Markarth would be wearing." Kerah: "I do have one set of bracelets in a style that is popular with the nobility in Sentinel." Hroki: "Sentinel? That's in Hammerfell, correct? And you say these bracelets are only worn by the nobility?" Kerah: "They are popular with the nobility there, yes. This particular bracelet is a copy of one worn by a Crown Princess." Hroki: "Hmm. Maybe in a few seasons I could afford such a treasure." Kerah: "Care to try out a new ring, or perhaps my daughter could make you a necklace..."
Hroki: "Oh, that sounds lovely." Kerah: "The city hasn't changed that much, dear. Same old dwarven stones gathering the same old moss." This page was last modified on 18 August 2018, at 21:22.